If your Woodstock area home is in need of gutter installation or gutter repairs, our professional contractors at One Man and A Brush are ready to help you get them taken care of. Gutters provide your home with an effective way to route rainwater away from the siding and foundation areas of your home. It’s important to know the gutter cleaning warning signs because if your gutter gets too blocked up it will no longer function as an effective guttering system and will most likely leak. A good gutter system may seem like it’s not an important thing to have, at least until the rain starts coming down fast. You don’t want to realise it’s importance when your gutters start overflowing due to it being clogged because you didn’t get a High Wycombe Gutter Cleaning company to clean them. As annoying as it is to have bucket fulls of rain pouring down onto your head whenever you enter or exit your home, it’s actually more important to have the gutter system installed in order to keep your home’s foundation areas from forming pools of water. This can cause huge foundation problems and cost you tens of thousands of dollars to fix. If you do find yourself in this situation, you can get a foundation repair company to come and fix it for you, but getting a quality gutter system can prevent this in the first place. A simple and inexpensive gutter system can be installed instead so you can not only enjoy easy entry and exit to your home when it rains, but also a healthy home foundation, siding, and roof top. At One Man and A Brush, our gutter installation and repair team can install seamless gutters and caps for your home’s roof structure. Seamless gutters are easier for contractors to install, which means they can help you save money on labor costs. Seamless gutters are much better than gutters that are prefabricated in certain lengths because every seam would be a weak point in the length of the system. Seams also tend to leak or get debris stuck in them easier. At seams, gutters will tend to work loose or get damaged, needing repair sooner. Seamless gutters are cut to length as needed onsite and are one continual length covering the entire distance needed so there is nothing to get in the way or break. If you have gutters that have been damaged, we can help you repair them. Again, gutters may not seem to be that important, especially when so many other things are going on in our lives these days, but they truly do protect your home from some very costly damages. 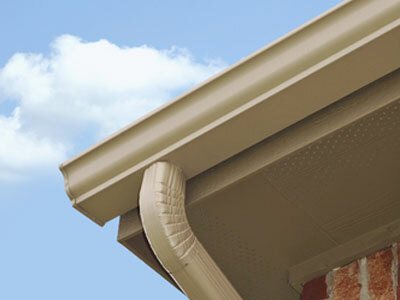 No matter the previous gutter type or color you have, we can help you with repairs. Just call us at the number below and we’ll schedule a time to arrive with a free, no obligation gutter repair estimate. As a local Woodstock painting and home improvement service provider, our team of experienced contractors can give you a great free estimate that we’re sure you’re going to love for your gutter installations or repairs. We’ve been assisting residential homeowners in the Woodstock area with all their home painting and improvement needs since 2005. We would love the opportunity to help you too! If you are looking for seamless gutters for your Woodstock home, call One Man and A Brush at 678-368-5115 or complete our online request form.